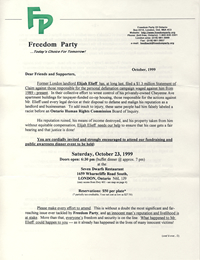 Four-page hardcopy letter from Robert Metz to members and supporters of Freedom Party of Ontario, inviting them to Freedom Party’s October 23, 1999 dinner at the 7 Dwarves restaurant in London, Ontario. The dinner featured guest speaker Rory Leishman (National Affairs Columnist for the London Free Press), and was held to help raise funds for Elijah Elieff’s 1998 lawsuit against Reverend Susan Eagle, the London Free Press and others who he believed had smeared him and financially ruined him. The letter included 7 pages of inserts, including profiles of Elieff, Leishman, and Metz, and related news clippings. The mailer was Mailed to members and supporters via Canada Post. Document Mailed-out: Approximately October 1, 1999.